After agonizing for nearly three years with a child who put everything in her mouth, the abundant parts are hard to get used to. Three is also the first year that board games, too, show up under the Christmas tree. They come with parts, too. And really simple instructions. Ironically, the game with the most parts won me over. 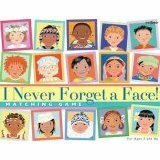 Friends who visited for dinner brought this wonderful and simple matching game called “I Never Forget a Face.” It’s basically a memory game, but the tiles used have faces of children from all over the world dressed in different traditional dress. The nationalities include Western cultures like France and Norway, and also countries of current interest like Myanmar, Afghanistan and Iraq. Play makes for an easy path to introducing diversity and cultural awareness. The manufacturer, eeBoo, also makes a version called “Life on Earth” with different animals and plants, teaching players about the diversity of life on our fair planet. Even though the age marked on the box is for five and up, by using half the tiles, a three-year-old can easily play, and beat, a forgetful adult. Ahem. Children can play alone or with more players. Adults may need to pair up in order to compete. For younger players, the game offers a way to teach patience and taking turns. The wide variety of faces being presented is a good message for a younger mind, too. On the other hand, the best thing about Candy Land, I’ve observed, is that it appears the cardboard and plastic pieces are all recyclable. Good. Hey, if it’s got a Red Wine Waterfall, count me in for a game.